Crisis is brewing in Puducherry Ministry with five ministers reportedly airing their grievances against Chief Minister N Rangasamy at ‘important power centres,’ aimed at removing him from the post. All the five Ministers – V Vaithilingam [Industries & Power], E Valsaraj [Health], MOHF Shajahan [Education], Malladi Krishna Rao [Tourism] and M Kandasamy [Welfare] – are away from Puducherry since Thursday and they have reportedly started lobbying against the Chief Minister. Moreover, the Ministers accused Rangasamy of autocratic functioning, while dealing with policies and decisions. Though Rangasamy has made a move to pacify the Ministers and the MLAs [Members of the Legislative Assembly], by approving several projects in Yanam as sought by Malladi Krishna Rao, purchase of polyester clothes for distribution to the poor as sought by Kandasamy, assigning the post of Government Whip to P Angalan, it turned out to be a futile exercise. Now, the party members loyal to Narayanasamy [Rajya Sabha member and lead protagonist in this battle for power] and the Ministers are confident that their grievances against Rangasamy would be dealt appropriately by the party high command. Whether Rangasamy can set right things and continue as the CM or not, will unfold in the days to come. Time will tell whether a change will occur, and whether that change will be good or bad for the future development of Pondicherry. Already, corruption, favoritism and negligence have taken an incredible (perhaps irreversible) toll on the environment, cityscape, and quality of life in Pondicherry. “Give me a lungi!” demands a cycle rickshaw driver. Drupad’s eyebrows shoot up and his eyes bug out (Drupad is a mime artist) as he recounts his experience being hit up for gifts during the Pongal holidays. “No, why should I give you a lungi? You give me a lungi!” he counters. They part amicably, since Drupad knows many of the cycle rickshaw drivers well. But the fact that they asked him (a starving artist) for a lungi shows how ingrained this sense of entitlement has become for the working poor in Pondicherry. Every elected official panders to the poor because their votes can be bought. And because there are so many of them. This Pongal, the Member of the Legislative Assembly (MLA) in our ward gave out a sari for each woman, a lungi for each man, and a water pot for each “poor” household in their constituency – 1,500 saris and lungis in this small ward. This past Diwali, he handed out milk sweets to every house (600) in the ward. There is no money to pay municipal contractors for street sweepers, yet there is money to provide sweets to some of the same people who have to borrow money at usurious rates (ten percent a day!) to survive. Each MLA keeps two to three men on hand to do his bidding, only he does not pay them. He strong arms contractors or businesses working in his ward to “employ” them while he has exclusive use of these men (usually goons), particularly for gift distribution during festival time. These politicians also bully people into selling land to them at below-market rates and extract free goods and services from business owners, all the while taking kick-backs from contractors. This money is plowed into construction and other businesses, which are then given government contracts, channeling public funds into their pockets as well. More funds to buy votes. So the poor become complacent and fatalistic. There is no use working hard, because they can’t work up from their current situation – they have no money to buy into better jobs. Employers also contrive to keep employees in their place – they withhold pay, accuse them of theft, let them go at a whim… And because none of what is rightfully theirs is given to them, they have come to depend on these free distributions as their only entitlement. An attitude that is encouraged and reinforced each holiday. Even today, five days after Pongal, some of the Shuddham ammas are demanding money from the houses where they collect garbage. We spent more time talking about how to deal with the local mafia in Kuruchikuppam and Vaitikuppam over the last few days than in actually moving the furniture and household goods this morning. Lata Iyer’s parents were moving into a half-finished house in Kuruchikuppam, a neighborhood just to the north of French town in Pondicherry, inhabited by a fishing community on the coast. Recently, the fishermen had begun organizing to form an informal “coolie” union – they would load and unload anything that needed to be moved in their area – for an exorbitant price – quick and easy drinking money. Lata had experienced one such incident when she tried to have a truckload of granite and marble unloaded. Men appeared out of nowhere, demanding that they do the work. Their fee was so high that the truck was taken out of the neighborhood and brought back in the middle of the night and unloaded very quietly. The truck had just turned off its engine when seven men (different from the sentries posted at the entrance to Kuruchikuppam) marched up and started demanding the work. Puru explained to them that this was our stuff, and we weren’t employing anyone else to unload it – we were doing it ourselves. In fact, it was going to be Puru and three other women. “Where are you from?” They demanded. “Maharashtra” replied Puru. “How would you like it if we came to your place and took work away from you?” Puru explained that we wouldn’t mind hiring them if they charged reasonable rates, but since they were trying to extort us, we were doing the work ourselves. To illustrate that point, I jumped in the truck and started unloading the smaller items. By then, Lata’s parents had arrived by auto rickshaw, and they got involved in the argument. One of the men appealed to Lata’s mother: “This man [pointing at Puru] shows up at all these occasions and tries to disrupt our livelihood.” I started handing things to Lata’s parents, and they gamely took them to the house as Puru continued to negotiate. One of the guys kept gesturing at me to stop, but he didn’t dare come too close to me since I was a foreigner. They kept telling Puru to tell me to stop. Then Lata arrived on her motorcycle and joined the frey. She made the mistake of calling them goondas. “Goonda?” they asked – they didn’t understand the Hindi term. “Rowdie” explained Lata (who is Tamilian). Well, that set them off. Insulted, they started arguing more vehemently than before. Then Maya arrived on her scooter, and she and Lata started carrying things to the house as I handed the items off the truck. In the end, the “rowdie” group split into two camps: one that agreed that there was nothing they could do to stop people from unloading their own things, and another that didn’t want to allow it. The first group won out, but not without one of the other group picking up a rock just outside the gate and threatening to throw it at Puru, who just stood there looking at him. They were finally defeated by 1) our number – including Lata’s parents, there were 6 of us, 2) the fact that most of us were women, 3) a foreigner among the group, and 4) the knowledge (somehow) that Puru had connections with the local police. After the rowdies left, the driver of the truck snuck back in and helped with two of the heavy items – a metal cabinet and a stone and metal grinder. The total cost of the truck, including the two guys who helped us load was Rs. 1,100 (US$ 28.21) for the three hour, multiple stop move. The rowdies would have charged at least Rs. 2,000 (US$51.28) for just 15 minutes of work. Using the excuse of dropping our friends and colleagues off at the airport in Chennai for their flight to Delhi this morning, Puru, Maya and I visited Vedanthangal Bird Sanctuary on our way back to Pondicherry. Vedanthangal is near Chengalpattu, in the Kanchipuram district of Tamil Nadu, around 85 kilometers south of Chennai and 77 kilometers north of Pondicherry. This is one of the few places in India where there is no differential pricing for Indians and foreigners. Adults pay Rs. 5 (about US $0.13) for entry. Taking in a still camera costs Rs. 25 (about US $0.64) while a video camera costs Rs. 150 (US $3.65). We got to Vedanthangal around 10:30am. Not the best time of day, and a Pongal holiday at that, so the Sanctuary was more crowded than usual and noisy with picnickers. However, we saw plenty of Painted stork, Open-billed storks, Grey pelicans, Black-headed (or White) ibis, Glossy ibis, Little cormorants, Night herons, Pond herons, all species of egrets, and a couple of different species of ducks. The photos shown on this post were taken by Puru Kothari, who has caught the shutter bug and hopes to return soon to take more pictures. There was a kolam competition early this morning on Beach Road in Pondicherry. Over 500 women (mother-daughter teams, friends, colleagues) participated in this annual event the day before the start of the 4-day Pongal festival. By the time I got to Beach Road in the late afternoon, most of the kolams had been destroyed by passing traffic, so all the pictures shown here (with permission) were taken by Policarpio (Tony) Soberanis, who was also too late to capture more than 230 of the 500 entries. Most of the kolams were fairly traditional, with flower and geometric themes. Some competitors added a twist by using chopped flowers, fruits and vegetables, and grains in addition to or instead of the white and colored rice powder. The second most popular theme was the peacock – the national bird of India. These three also caught my eye. Is that a menorah in the middle of kolam # 206? “Ma’am, the Flintstones.” Does everyone know about the Flintstones? “Yes ma’am.” “Tom and Jerry, ma’am.” “WWF” (World Wrestling Federation, now World Wrestling Entertainment). I am stunned as other suggestions, such as “Father Christmas” are proposed by the 20 (Hindu) students of Tagore Arts College. Eventually, the suggestions turn to South Indian film stars (Rajnikant and Ajith), and Indian cricketers (all men). And I begin to feel a little easier. We had gathered on a Saturday morning to engage the Tagore Arts College student members of the NSS (National Service Scheme) in an awareness campaign to stop littering on Beach Road in Pondicherry. We (the members of Shuddham and two visiting students from the University of Iowa) were hoping to pump up these first 20 NSS students to start a “Beautiful Pondicherry” movement, first at their school, then on Beach Road, then throughout Pondicherry. They accepted a very tight deadline to start the first “action” on Beach Road the next Saturday evening. These students, most of whom are first generation college students, are part of the Indian juggernaut hurtling towards progress a la the U.S. in the ’50s, consuming sanitized U.S. pop culture (no one mentioned Itchy & Scratchy), material goods (the latest cell phones), and mineral resources. The students left completely jazzed, discussing among themselves how they could get their entire college clean before our next meeting on Wednesday. (During our visit to the principal last week, we observed piles of trash everywhere.) We settled on them dressing up as the Indian cricket team (uniforms are easy to get anywhere), but with capes emblazoned with “Beautiful Pondicherry”, some in English and some in Tamil. Dress rehearsal is on Friday. The performance on Saturday. Happy new year from Pondicherry! This kolam in front of the Shuddham office was done by one of the women (on her own initiative) employed by Shuddham to clean the streets in the Raj Bhavan ward. Selvi started at about 5pm yesterday, sprinkling water around the area in front of the office to cleanse the thresh hold. In an hour, she was done, silver sparkles and all. 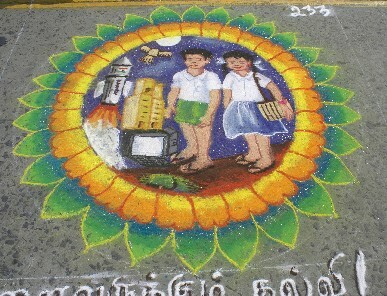 In Tamil Nadu and Pondicherry, women usually get up early in the morning to draw simple kolams with white rice powder. For special occasions, the designs become elaborate, and are done in color. From now until Pongal, the major South Indian harvest festival on January 14th, the kolam designs will get more and more elaborate until on the day of Pongal they fill up the entire street.